Patrick was amazing! He kept everyone on the dance floor all night long! I would highly recommend him to anyone, for any type of venue!!! Dj Shemes was awesome! He was very professional and flexible to the 2 day different culture Wedding. Not only did his music keep everyone on the floor his hosting skills was impeccable. Schemes made everyone comfortable and out of there seats which made it a night to remember. Without a doubt, booking DJ Schemes was the best decision we made for our wedding day. We provided limited but specific directions — Make the reception a memorable party. DJ Scheme’s asked a few follow-up questions and delivered with minimal guidance. Our guests were literally on the dance floor before the scheduled party time (which we loved). It was important to us that all generations in attendance enjoyed themselves (and danced) and he managed to cater to everyone the entire night. The dance floor was never empty. The venue had to turn on house lights to get our guests off the dance floor. It’s been a month a people are still talking about the DJ and the party. I cannot recommend DJ Schemes enough. Seriously, plotting a way to use him again soon! CHOOSE DJ SCHEMES! My guest were on their feet the entire night. The music was so good my guest barely ate. Not Kidding. Being a bride, there is definitely this heavy weight that you carry around before the wedding, hoping that your guest feel like they thoroughly enjoyed themselves. But when my guest called and sent texts saying that my wedding was literally the BEST wedding they've attended, I know that was all because of DJ SCHEMES! Patrick Fletcher (DJ Schemes) was great. Very professional, flexible and willing to meet in person to iron out all details. He's open to playing whatever music you want and is willing to make sure he provides the exact services you need. He has top of the line equipment and knows how to mix music well. I was very pleased. I would suggest him to anyone! hes great! DJ Schemes was phenomenal! His variety of music, attention to detail, and energy had people dancing the ENTIRE night. We could not have asked for a better DJ and we're extremely blessed to have him share this great night with us. People are still raving about how much fun they had, and how EPIC our wedding was; we certainly thank DJ Schemes for his services. He was very easy to communicate with and VERY responsive to my texts. Was referred by a friend and was a little concerned with finding a DJ to deliver hip yet CLEAN music for a corporate event. He was PERFECT! Delivered beyond my expectations. Would definitely use again! Not Gimmicks Just Schemes and staff provided excellent service for my event. Patrick "DJ Schemes" Fletcher and his crew were extremely professional. They even provided audio equipment for the ceremony. They made the reception enjoyable for all ages. They were even able to work within the tight constraints of the venue that only allowed a very small time frame to set up. I would highly recommend their services to anyone. DJ Schemes was very professional and easy to work with. He is well versed in all genres of music and played music everyone could enjoy. It was clear from my interactions with DJ Schemes that he has a lot of experience so I felt confident going into my party knowing that he was working with me. DJ Schemes arrived well ahead of time to make sure everything was in place for the party and kept my guests entertained throughout the evening. I would highly recommend working with DJ Schemes for any and all events. DJ Schemes was absolutely amazing at my destination wedding. He turned my wedding from a beautiful rainy ceremony into a blazing hot dance party during the reception! He played music that all my guests could enjoy from the youngest to the oldest of my loved ones. He did not need much instruction as he was well-experienced in the order of ceremonies for a wedding and how to hype the crowd and keep the timeline flowing seamlessly. The best part, he not only served as a DJ but as the master of ceremonies so I got the best bang for my buck. I would certainly recommend DJ Schemes for your wedding DJ needs. 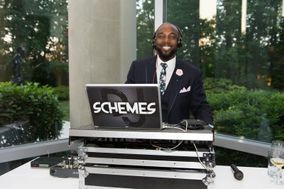 My wedding reception was a dream come true and that could not have been possible without DJ Schemes. He caters the music to the desired genre or genres of the bride and groom. His level of awareness of what the guests want to dance to is impeccable, he knows how to keep the party going. Want an event that will keep you and your guests talking about how much dancing and fun they had? I highly recommend DJ Schemes for any event, you will not be disappointed! If you want your wedding reception to also be the best party you've ever been to, then this is the man for the job. Not only was he very professional and responsive, but he took the time to come see our wedding venue to make sure he had all of the appropriate equipment and understood the layout. We gave him a list of songs to play for the processional and recessional, respective family dances, and a handful of must play songs and he handled the rest. Three months later my friends and family are still talking about how much fun they had at my wedding and how great the DJ was. The dance floor was packed from start to finish and we basically had to force people to go home. He has an amazing ability to read the crowd and adjust to their music tastes and he even dealt very graciously with that one auntie who doesn't understand that she can't stand by the DJ booth and order him to play music she likes :) I'd also highly recommended him for Caribbean weddings as he definitely understands what we like to dance to. Overall, an amazing experience working with DJ Schemes. My husband and I frequent a club in the DC area that DJ Schemes plays at a lot. Over the many times that we have gone there, we were able to develop a relationship. He always played my favorite song.....POISON :-) When we started to plan our wedding I already knew who the DJ would be with no doubt in my mind. He is so easy to work with and very laid back, he truly makes sure that he has everything for that special day. The day of the wedding I couldn't have been more happy and proud on the work that he did. My wedding was lit and the dance floor was never empty. If you are looking for great energy book DJ Schemes. He will always be my DJ for any event I have in the future. AMAZING!!!!!! DJ Schemes was a class act, family and friends are still talking about how great the DJ was. Spectacular... gave a few songs list and he composed something extraordinary throughout the night. It flowed and was appropriate for each section of the wedding ceremony and reception events. Trying to satisfy Nigerian roots on one side and Jamaican on the other is not an easy feat. Have this guy negotiate the middle east peace talks!